The ability to travel is a privilege — one that, under normal circumstances, I wouldn’t be able to afford. Artist life doesn’t typically generate a whole lot of income and those who know me know that I’m pretty dreadful at keeping track of what little money I earn. So I’m extra grateful for organizations, like the Canada Council for the Arts and the BC Arts Council, that provide travel assistance so that folks like me can share what we do with people around the world. During my stay I was overwhelmed by the generous spirit of practically everyone I met. I was delighted to meet Natalia Solomonoff and Hans Tutschku — both marvelous, original composers; and I’m particularly happy to have met flutist Valentina Daldegan and her husband, the composer Maurício Dottori, who went out of their way to show me their city and share their enthusiasm for new music and music education (and for gifting me with a beautiful bottle of cachaça! ); and I’m especially grateful to the festival organizers, Felipe Ribeiro and Caio Nocko, for inviting me and taking care of the myriad details that a symposium of this size and scope requires. Cachaça shopping with flutist Valentina Daldegan! Artists are a thankless lot. Of course, there very well might be artists out there who completely disagree with the above, who are satisfied and thankful, who do not crave/despise the approval of others, who thrive on order. To you, I can only say this: I’ve got Martha Graham backing me up; you don’t. This week, it is with mixed feelings that I step down from my position as artistic director of the Powell Street Festival Society, Canada’s largest expression of Japanese Canadian culture. I’m happy and humbled to pass the baton to the incredible Leanne Dunic, whose background in the literary, visual, and musical arts will energize and inspire the Society as it moves into its fourth decade. I’m entirely thankful for the experience: over the course of two seasons I learned about the complex and dark history of my Japanese Canadian heritage; I engaged with artists and communities I would never have had the opportunity to otherwise; I learned the nuts and bolts of curating a major Canadian festival (and for the record, there are a lot of nuts and bolts); and I learned how important it is for an artistic director to be surrounded by good, patient, informed, and inspired people. Most importantly, I learned that daily coffee breaks with Diane Kadota are generally awesome — they provided insight, inspiration, therapy, and caffeine. It doesn’t get much better than that. But throughout my tenure, that “blessed unrest” was percolating beneath the surface, reminding me that, ultimately, I’m a musician before anything else. And so it is to music that I return, with renewed and refocused energy. This September I will join the faculty of the University of Victoria’s School of Music as their interim flute instructor (filling in for the sabbatical of my friend and colleague, Suzanne Snizek). It will mean a term of craziness as I zig-zag between the mainland and the Island, but it’s an experience I’m thrilled to begin. September will also see my first sojourn to South America, as I join the faculty at the third International Symposium of New Music, presented by Grupo de Pesquisa Núcleo Música Nova in Curitiba, Brazil. From September 11 – 17 I’ll be giving masterclasses, workshops, and performances that will include the South American premieres of works by Nicole Lizée and Dániel Péter Biró, in addition to works by Sciarrino, Solomonoff, Feldman, and Ferneyhough, whose Carceri d’Invenzione IIb (inspired by the infamous etchings of Piranesi, pictured above) remains one of my all time solo flute faves. But for now, it’s a whole lot of practising, score study, cautious stabs at beginner Portuguese, and coffee. A vida é maravilhosa! Confession: I have always been a flute choir nerd. I love the idea of creating community and camaraderie within what’s really a very competitive profession — and let’s face it, flutists can be quite competitive with one another. So an environment where we convene in large numbers to work towards a common goal is, I’ve found, always a nice change. I can only assume, of course, that this warm, fuzzy, socialist euphoria is what violinists feel every day of their orchestral lives, right? Am I right?? Well, at any rate, multiple flutes sound bloody awesome. Believe it or not, this is not my professional slide whistle debut. Photo by Jeff Stonehouse. The evening was completed by a theatrical flutist tour-de-force: Dissection de l’oubli by Evelin Ramon, performed by the jaw-dropping Marie-Hélène Breault. The beautifully made video below provides some tantalizing glimpses into these complex, bizarre, and alluring sound worlds. Here’s to a Four Horsemen remount in Vancouver soon! Photo by Jan Gates. From Music on Main’s Orpheus Project, 2014. Composers! Composers! I’m teaming up with my old pals at Redshift Music Society: we’re putting out a Call for Scores for solo flute written by composers who live or originate from countries situated along the Pacific Rim. Selected works will be performed in Redshift’s 2016/17 season and then recorded for CD release on Redshift Records. Why do this? Because, more than anything else, I’m really curious to see what’s out there. Why Pacific Rim countries? That’s a good question. So many aspects of my life are “Pacific specific”: I’m half Australian, half Japanese, and I live on the West Coast of Canada; Vancouver is a nexus of Asian, Australasian, North, Central, and South American cultures. And while contemporary art music is very Eurocentric thing to specialize in, much of what I do is informed by a heritage that is rather non-European — and this seemed like a cool way to make connections with emerging and established composers who I might (or might not) think along these same lines. All submissions can be sent to redshift.flute@gmail.com. The Official Call is below. Please share widely! Redshift Music Society is working with Canadian flutist Mark Takeshi McGregor to create a performance project that explores new and recent contemporary works for solo flute by composers who live in or originate from Pacific Rim countries. McGregor, a Pacific Rim hybrid himself (a Canadian/Australian citizen based in Vancouver, the product of Japanese and Australian parents), has spent much of his recent career exploring western art music through a non-European lens. This project is an opportunity to connect international composers, explore and celebrate commonalities/differences, and to create professional bonds that may lead to future collaboration. Selected works will be performed by McGregor in Vancouver during the 2016/2017 concert season. Depending on the number of submissions, there is a possibility for multiple concerts in order to include as many works as possible. Following the performance, these works will be recorded for release on the Redshift Record label (approximate release date: 2018). Selections will be made by McGregor and a panel of professional composers and specialists. All decisions are final. To learn more about Mark Takeshi McGregor, click HERE. To learn more about Redshift Music Society, click HERE. To learn more about Redshift Records, click HERE. I’ve known Michael Oesterle way longer than I’ve known his music: we were students together at the University of British Columbia back in the 90s. I knew him primarily as a violin player in the orchestra (and once, he even played mandolin for a performance of Respighi’s Roman Festivals). It would be many years later when I got to know Michael the composer, primarily through my work with the Aventa Ensemble: Urban Canticle, territio verbalis, and tell tales (the latter two pieces written especially for Aventa) are all beautiful, colourful, and deftly wrought ensemble pieces. But it wasn’t until I heard Stand Still — his solo violin piece that he wrote in 2011 for Aisslinn Nosky — when I realized that here was a composer who understood the complexities and subtleties of writing for an unaccompanied instrument; who could reference the instrument’s incredibly rich history of both hedonistic folk music and 18th century polyphony, all the while cunningly maintaining his own unique voice. I cautiously approached him to ask if he’d consider writing a piece for solo flute… and after much scheming and generous support from the Canada Council for the Arts, Delilah was born in September of 2014. Delilah was inspired, like many of Oesterle’s works, by the British mathematician, logician, cryptanalyst, philosopher, computer scientist, mathematical biologist, marathon runner, and persecuted homosexual Alan Turing (1912-1954). In 2012, Turing’s 1944 reports on his “speech system” Delilah, were finally pulled from the British National Archives and opened to the public. This functional machine, designed to scramble and descramble voice messages, was so far ahead of its time that it resembles the way we currently store music in digital format. The musical construction of Delilah for solo flute was motivated by Turing’s unorthodox search for humanity or human intelligence within patterns and systems. It searches for answers to an unasked question, allowing this systematic approach to create subtle emotional shifts. Like Turing, it presents its puzzle playfully: in its persistence it becomes serious and then, as it begins to wallow in the process itself, lightens its mood again: a simple arc in a pattern of system, method, and discovery, its greatest motivation the joy of moving forward (from Oesterle’s programme notes). A couple weeks ago I headed over to Jordan Noble‘s abode in North Vancouver and we spent the good part of the morning laying down a proper studio recording of Delilah. Thanks to Jordan’s editing skills and a bit of reverb you’d never know that this piece was recorded… in his bedroom. Delilah is joyful, mesmerizing, virtuosic, and bittersweet — and it’s a delight to be able to share it. Anyone who has ever had to work towards a looming deadline will appreciate (or resent) the passage of time. For composers, time is of course the canvas on which they write — and if you’ve ever had the opportunity to talk to a composer working on a commission, you’re probably familiar with time-related statements like “I need to write another five minutes of music,” or “My piece is longer than what they asked for,” or even just plain old “Oh God, I need more time!” For us listeners, pacing and duration are key ingredients in how a piece of music impacts us emotionally: the 17-second brevity of Schoenberg’s Galgenlied from Pierrot Lunaire Op. 21 instantly conjures up images both horrific and humorous; whereas an hour+ long performance of Terry Riley’s In C can lull us into a trance-like state where an entire evening can slip by unnoticed. Next week I’ll be giving the Vancouver premiere of a piece that definitely makes its home on the large-scale end of the time spectrum. On Wednesday, March 9th, 2016, Redshift Music Society and Little Chamber Music Series That Could will present Piling Sand – Piling Stone 4 for flute and MaxMSP by Moncton-based composer André Cormier. There are few artists I know who play with the concept of time like Cormier: Piling Sand – Piling Stone 4 is part of a series of pieces that gradually reveal themselves to the listener over the space of 90 minutes. One by one, notes are played by the flutist, which are recorded and looped back every six minutes through a multi-channel speaker installation. Ever so slowly, the piece becomes layered through the speaker playback: it becomes denser, richer, and more elaborate, until the final six minutes reveal the “complete” piece, with swirling flute lines and Tibetan finger cymbals. In particular, the opening of Piling Sand – Piling Stone 4 is worth mentioning: essentially a blank canvas for sound, the piece begins with a full six minutes of silence. Some people have given me double-takes when I tell them this, but this extended silence serves an important role: the first two minutes is spent wondering what the hell is going on; after four minutes, your inner clock begins slowing down; and by six minutes, you’ve truly entered a deeper listening state, making the first utterance of the flute — a pianissimo F# — seem like a shattering intrusion. It’s a very special listening experience, the likes of which is almost impossible to achieve in our 21st century “Age of Instant Information”. Piling Sand – Piling Stone 4 is unquestionably challenging — and I’m the first person to say that it’s quite possibly not a piece for everybody. But after premiering this piece in New Brunswick back in 2013, I know that this piece can have a very powerful effect on those who are willing to be openminded to truly new listening experiences. Piling Sand – Piling Stone 4 takes place this Wednesday, March 9th, at 8pm at Celebration Hall at Vancouver’s Mountain View Cemetery (39th off Fraser St.). This event is FREE. There will also be a free artist chat at the Canadian Music Centre‘s BC Region (837 Davie Street) on Monday, March 7th at 4:30pm. Both André Cormier and myself will be there to talk more about the piece! Last night was a sad night indeed: the final drops of my Slivovica — the plum schnapps of Slovakia — was shared among friends and loved ones… and I’m left wondering how one can acquire more of this in Canada. But while the schnapps may be gone, there is no lack of fond memories of the week spent in Bratislava, where I gave the premiere of Nicole Lizée‘s Tarantino Études at the Melos-Ethos Festival. We heard some incredible performances, met lovely people, ate excellent food, and I spent a good part of an evening discussing the movie “Slap Shot” with a bartender who was kind enough to introduce me to his country’s national drink. Bratislava is a beautiful city, situated on the Danube River and extremely close to neighbouring Austria and Hungary. The old town is closed to motor vehicles, so it’s easy to get the sense of what the place was like in ages past. Tarantino Études was premiered on November 12, 2015 to a packed hall at a4-Zero Space, a contemporary/experimental performance venue with a diverse and enthusiastic following. Those in the know will appreciate the unbelievable amount of work that goes into creating a festival of this size: we’re talking fifteen events over seven days. Kudos to everyone at the Melos-Ethos Festival, especially Festival Director Ol’ga Smetanova. St. Michael’s Gate, the last standing city gate from the medieval fortifications. Bratislava Castle, which overlooks the city. St. Martin’s Cathedral, viewed from Bratislava Castle. Bratislava’s Old Town; Bratislava Castle can be seen in the distance. The Slovak Radio Building, which houses a number of concert halls and visual art displays. The “UFO Bridge”, straddling the Danube. Almost immediately after the premiere, Lizée and I were back in Vancouver for the North American premiere at Music on Main, which was celebrating its tenth anniversary with its largest Modulus Festival to date — all the more impressive when you consider that the number of MoM staff who made the week happen could all fit comfortably in the back of a Škoda (bravo to Dave, Melody, and Genevieve!). The evening of November 17th included music by Stefan Prins and Caroline Shaw, as well as Lizée’s Tarantino Études and Karappo Okesutura, featuring the Music on Main All Star Band with the incomparable Charlotte Cumberbirch. And what about the piece itself, you ask? How is the Tarantino Études? Well, I’m perhaps a bit biased, but Lizée has created a serious multimedia masterpiece: hours and hours of film footage were obsessively combed through to find a handful of incredibly potent but unlikely moments musicaux, which are looped and glitched. The result is an audio-visual world that is at once mesmerizing, visceral, disturbing, and hilarious. For a wee taste, here’s an excerpt from the premiere performance at the Melos-Ethos Festival in Bratislava — but be forewarned: it is the Tarantino Études after all, so there is some, uh, “language”. I first met Montreal-based composer Nicole Lizée almost exactly two years ago: the Little Chamber Music Series That Could and I had co-commissioned her to write a new work that dealt with grief for LCMSTC’s All Souls event at Vancouver’s Mountain View Cemetery. The resulting commission, Ouijist, is a piece that still haunts me: dark, touching, and a warhorse virtuoso role for percussionist Ben Reimer. After the performance, emboldened by a post-concert repast of fried chicken, waffles, and bourbon, I asked Nicole if she’d consider writing a new piece for flute and electronics. She agreed (such is the power of fried chicken, waffles, and bourbon), but immediately stipulated that the new piece would be written for bass flute. Bass flute, baby. Bass flute. As Nicky and I started talking about this new commission in more detail, I knew she was in the midst of composing a series of pieces that explored the works of particular film directors — she called these her “Criterion Collection”. 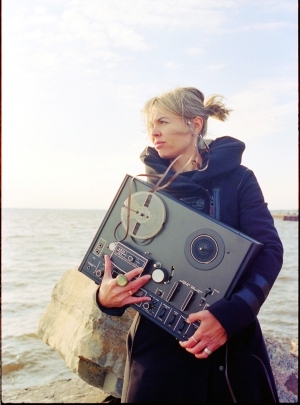 Lizée’s music is infused with tributes to popular culture, whether it be film (Hitchcock, Kubrick), music (Rush, DJ turntable art), or even toys (those of us born in a certain age will remember the Omnichord or the electronic game “Simon”, both of which have made appearances in Lizée’s music). She remains unique in her ability to create music that is chilling, funny, and occasionally flat-out demented while referencing iconic moments of 20th century popular culture — this is new music steeped in 70s/80s pop nostalgia. So I was surprised when she proposed that her new piece for bass flute and glitch would pay tribute to the work of Quentin Tarantino — a cultural phenomenon firmly rooted in the 90s/21st century. I should probably clarify that: when I say “surprised” I mean “peel-me-off-the-ceiling excited”, not just because Tarantino is one of my all-time favourite film directors, but because so many aspects of his style — the juxtaposition of humour and violence, soundtrack-driven narratives, a love of pop culture iconography — are things that, I feel, resonate very strongly with Lizée’s music. The world premiere of Tarantino Études was originally planned to be at Music on Main’s 2015 Modulus Festival — but in a fit of incredible generosity, MoM’s artistic director Dave Pay arranged an introduction with Olga Smetanova of the Melos-Ethos Festival in Bratislava. 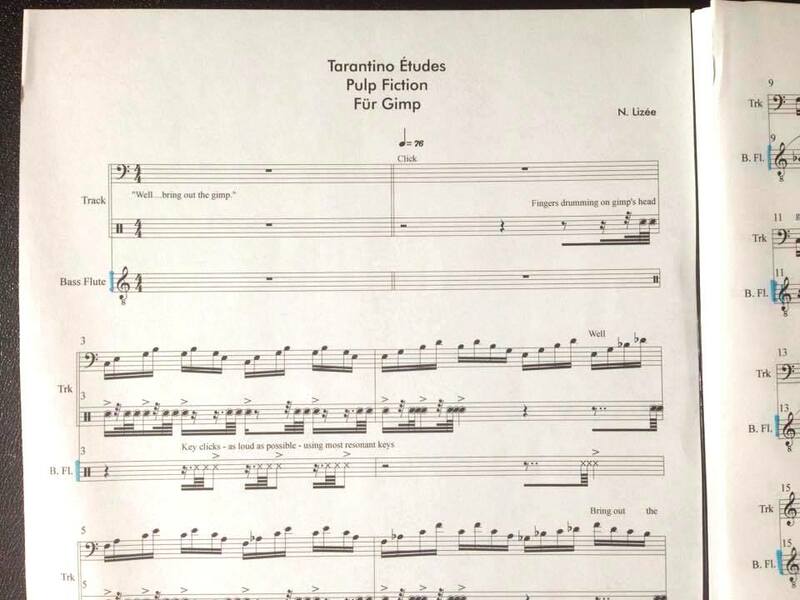 As a result of this introduction, Nicole and I are on our way to Slovakia this weekend to give the European premiere of Tarantino Études on November 12th at the Melos-Ethos Festival, followed by the North American premiere at Modulus Festival in Vancouver on November 17th. This past week my email correspondence with Nicky has been dealing primarily with extra-musical devices and props for these performances — some of these requests have been entirely sincere, others… not so much: whistling, guitar playing, sword swinging, and Japanese school girl outfits have all been discussed at length. Which of these are fact and which are fiction, you ask? I suppose there’s only one way to find out.